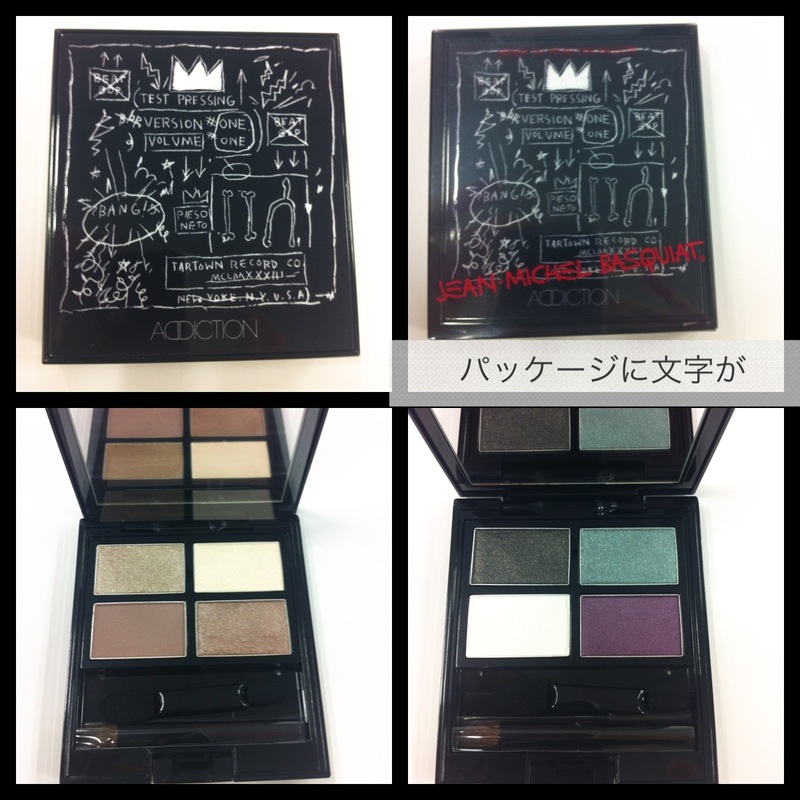 According to Eclat, Addiction will release a Ready To Wear Basquiat Limited Edition collection on 10 May in Japan. It appears that there will be six of these eyeshadow quads, retailing at 6510yen each. The one on the left is Tuxedo Moon and on the right is Mad Club. The palettes feature illustrations by New York graffiti artist Jean-Michel Basquiat. Eclat also provided this sneak peek of the Les Merveilleuses by Ladurée summer collection which will be released on 3 May in Japan. 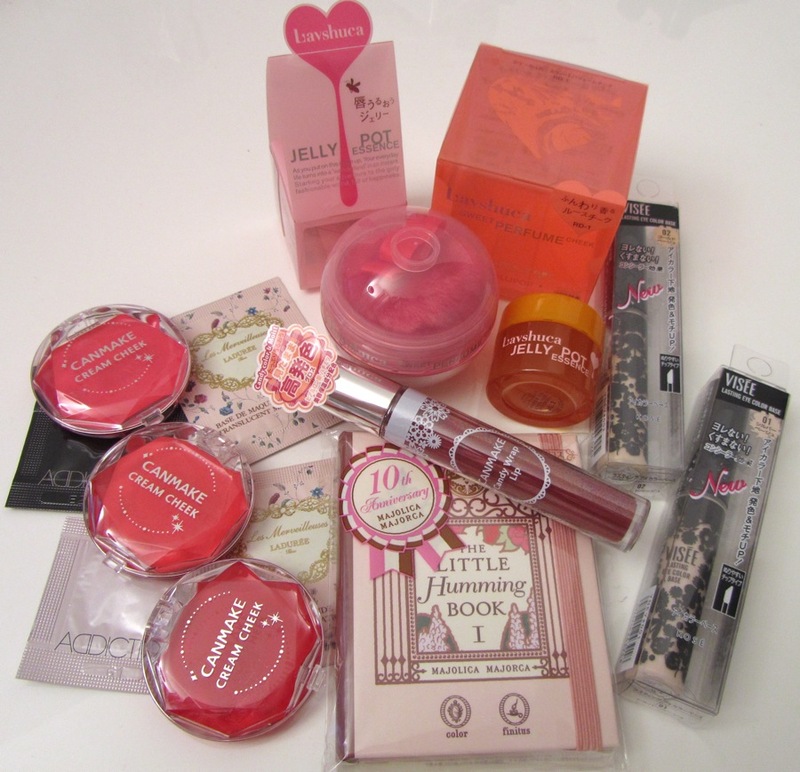 It includes liquid blushes, Mixed Pressed Cheek, eyeshadow palettes and a paper vanity box. 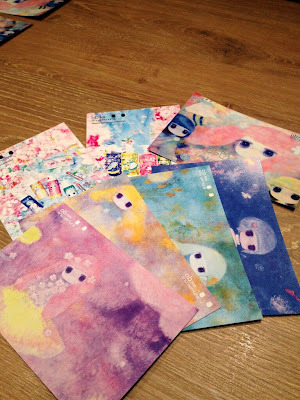 Love the purple brush! The patisserie brand will open two outlets in Ngee Ann City in Singapore this April (selling macaroons, not the makeup). The Lunasol Taiwan Facebook page has many pics from their press event for the Spring 2013 collection here. Bourjois has just released a new version of their popular Healthy Mix Foundation (CHF25.90) over here in Switzerland. 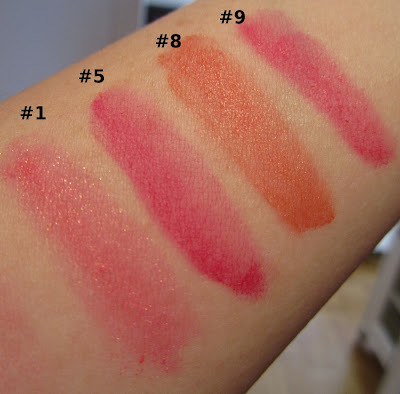 It is available here in six shades whereas there will be eight shades available in the UK where it is scheduled to launch in March and retail at £9.99. 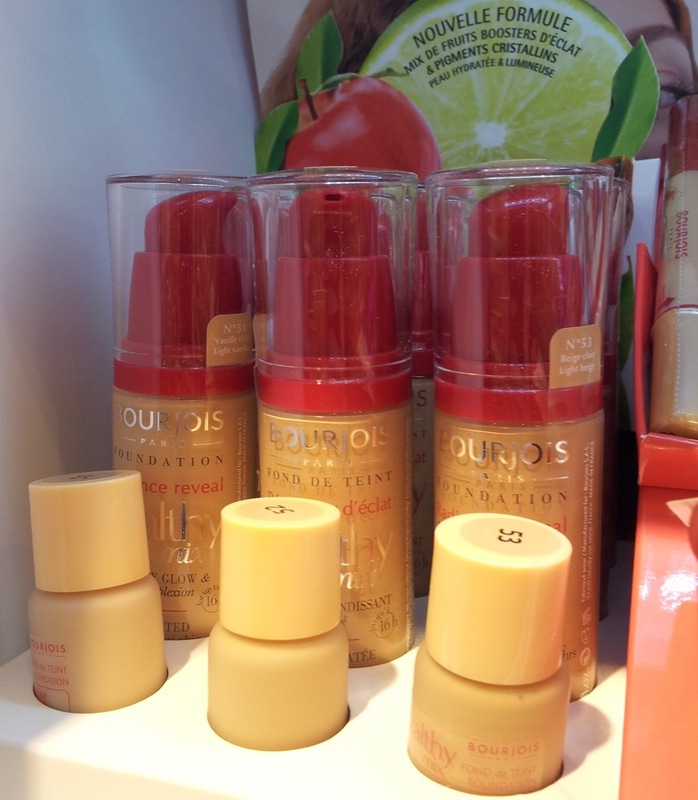 The new formula helps to provides a luminous application that is 70% more radiant. It contains a greater mix of fruit extracts such as apricot for radiance, melon for hydration and apple for youth protection, plus anti-oxidising vitamin E derivative. 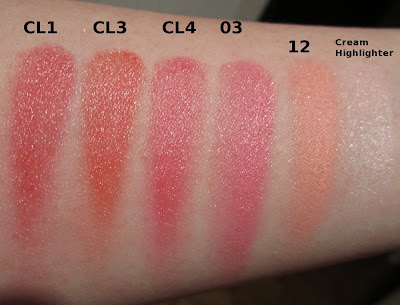 Cystalline pigments help even out the complexion and let natural light through the skin. 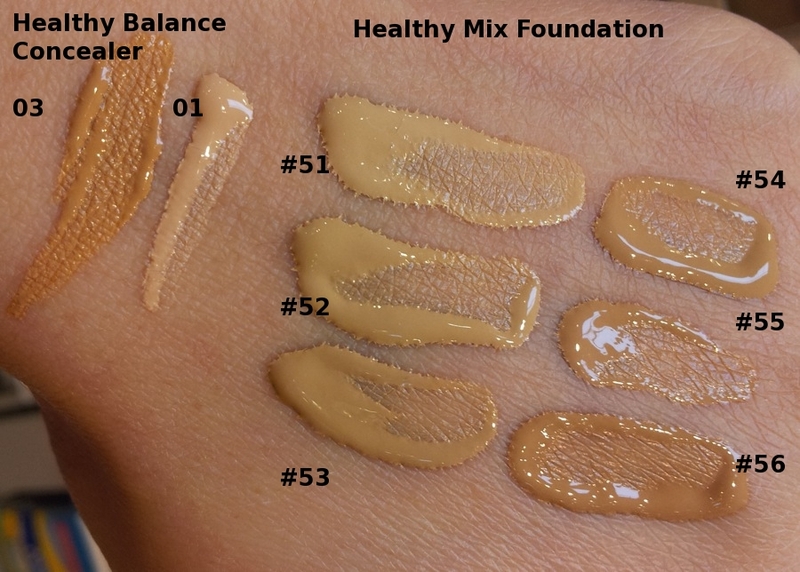 The foundation is also designed to have just the right balance of yellow and pink undertones to reveal the freshness of the complexion. The Radiance Reveal Healthy Mix boasts a new glass pump bottle packaging, which gives it a more classy feel than the previous plastic bottle. There is also a new peach-toned #41 Healthy Mix blush, Healthy Balance Matte Finish powder and Healthy Balance concealer. The foundation's texture feels very similar to the original Healthy Mix and it still has that slightly sweet fruity scent. It evens out the skin surface nicely with a natural, lightweight finish that sets quite nicely without feeling oily or overly matte. 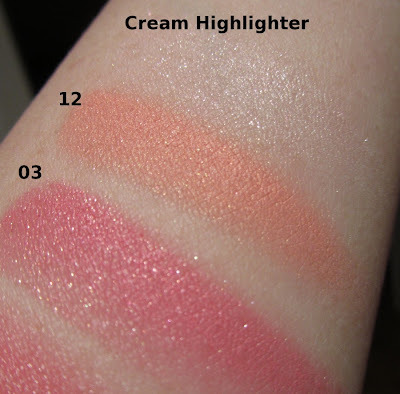 I only swatched this on my hand so I can't say how well it performs. There does seem to be a good range of light to tanned shades for this, which is impressive for a drugstore brand. 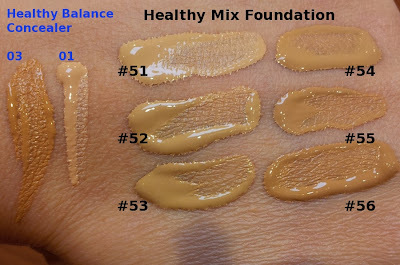 I am usually #51 or #52 for Bourjois foundations. 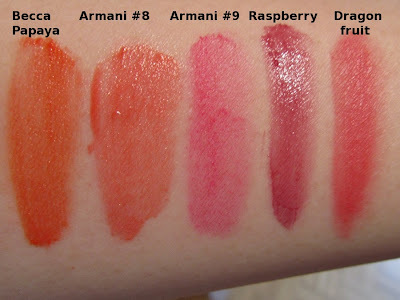 From the Armani spring 2013 Pop collection, the only items that caught my eye were the two new Blushing Fabric gel blushes in #8 HD Orange and #9 HD Fuchsia (US$39). I ordered these from Nordstrom.com. 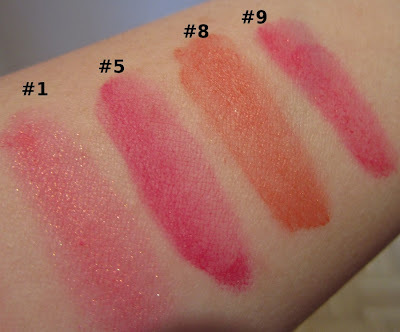 My current collection (from left): #1 Shimmering Peach, #5 Raspberry, #8 HD Orange and #9 HD Fuchsia. 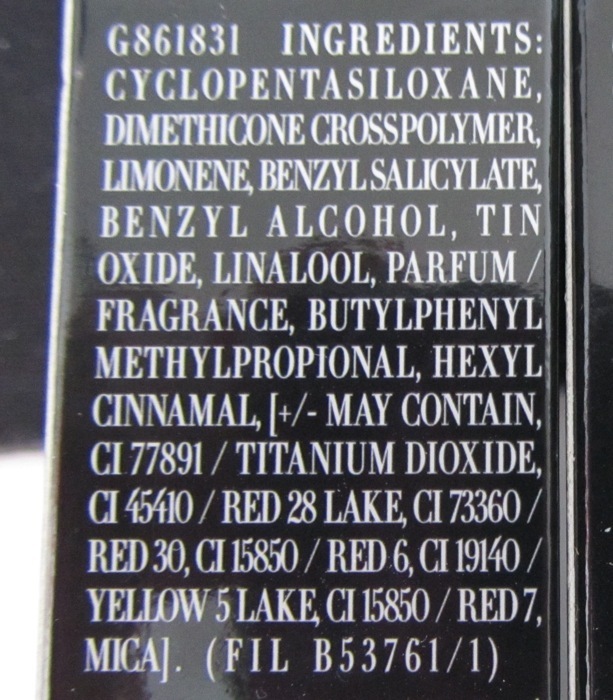 The shade names are not listed anywhere on the boxes or the tubes. 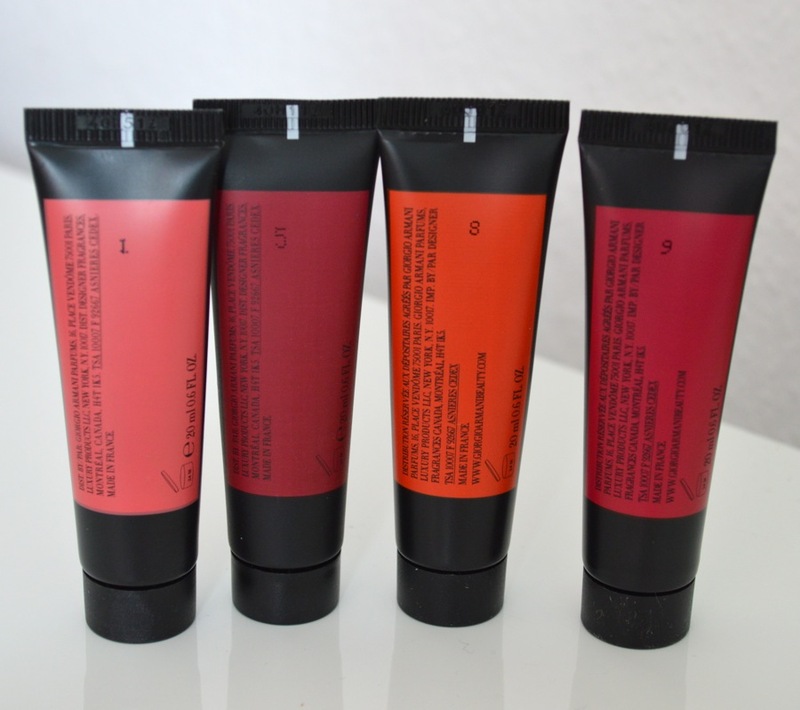 Only the shade numbers are printed on the back of the tubes. 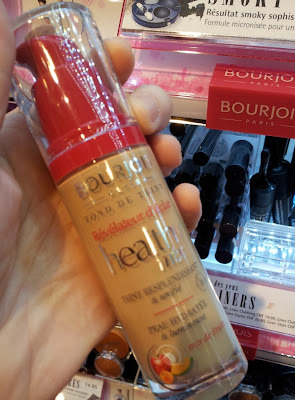 Made in France, each Blushing Fabric contains a very generous amount of product at 20ml, versus a mere 7ml for Becca Beach Tint. 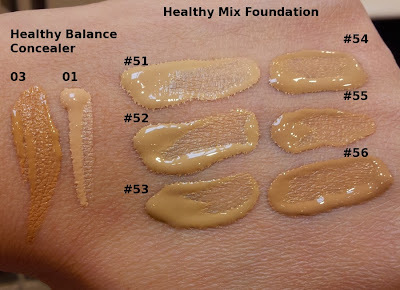 With just a little bit needed for each application, these literally take years to use up. List of ingredients below. 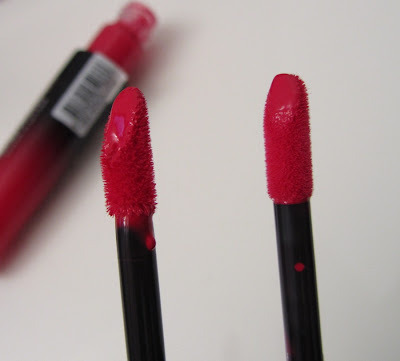 Just a tiny pin-head sized dab is all you need for a natural flush of color. 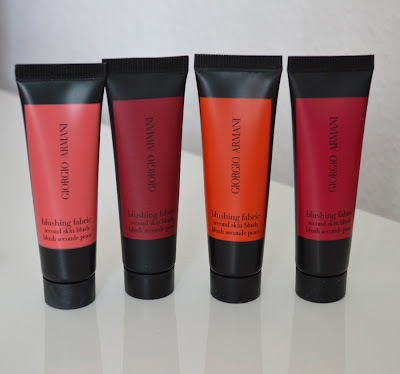 Armani describes it as "crafted as a micro-blend of pure water-soluble pigments and laquers, this cushiony formula delivers buildable color for cheek and face that is both imperceptible and long-lasting". You can see swatches of other Blushing Fabric shades in this earlier post. 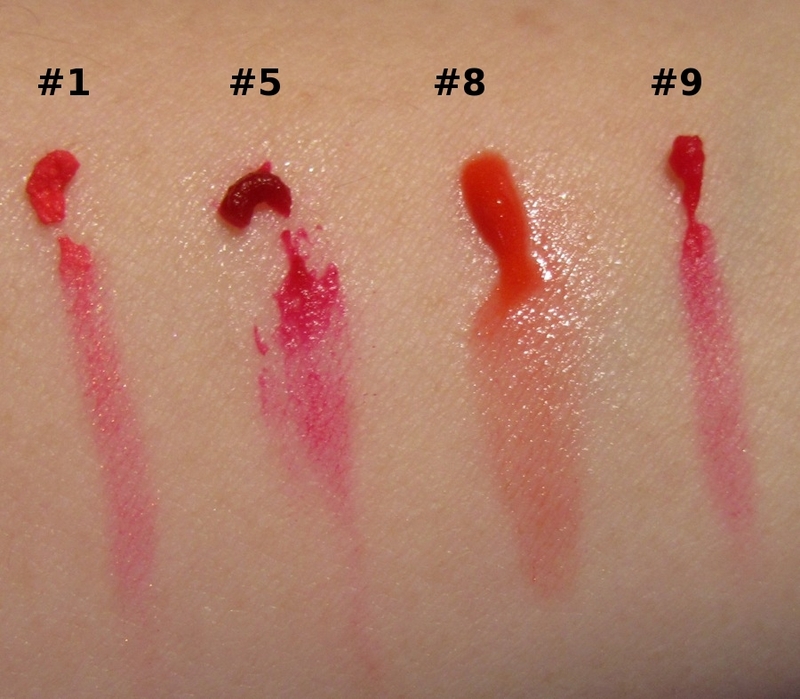 I found #9 HD Fuchsia to be quite similar to #5 Raspberry. 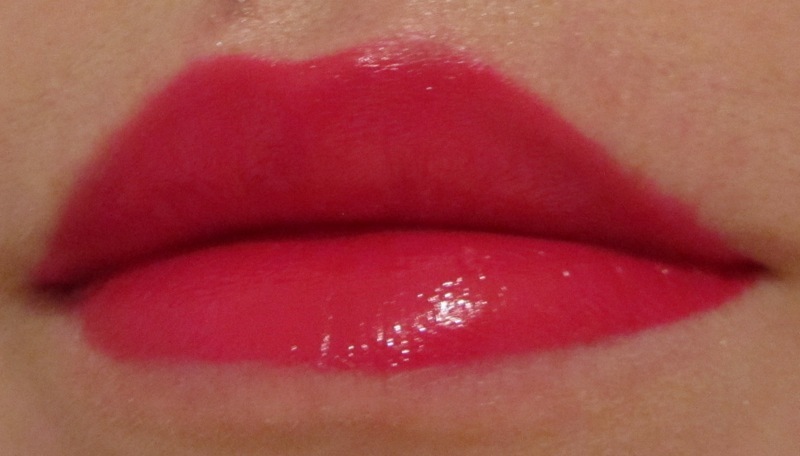 Raspberry is more intense and leans more hot pink. 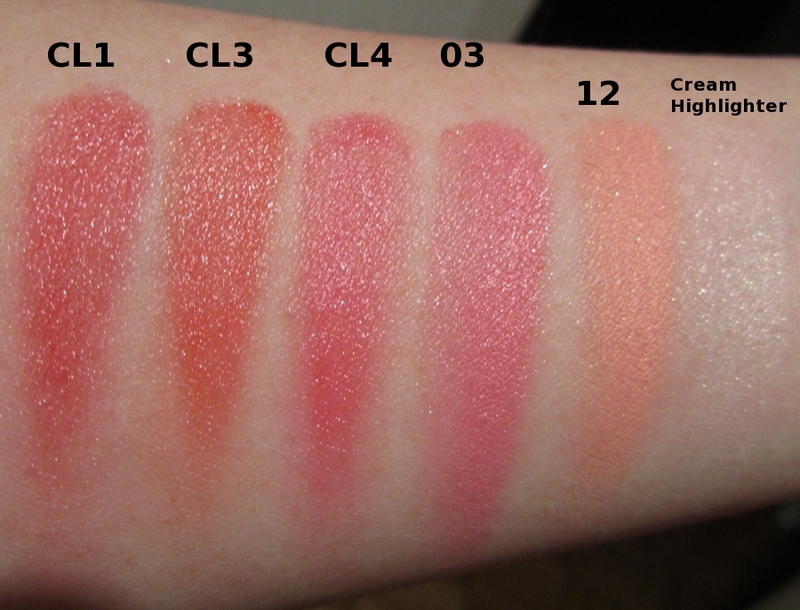 HD Fuchsia also swatches a tad patchily compared to Raspberry. #8 HD Orange has a subtle sprinkling of refined shimmer flecks that are not as obvious or numerous as those in #1 Shimmering Peach. 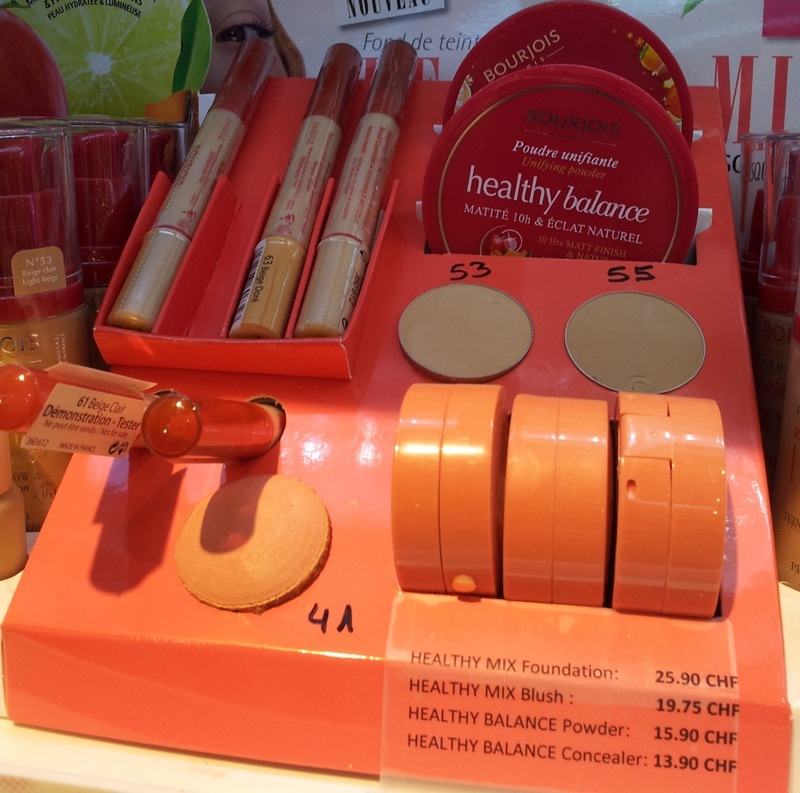 The Blushing Fabrics are super easy to apply and blend to a natural finish, adding a healthy touch of color that never looks overdone. 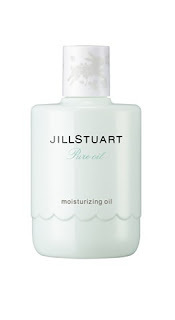 They also do not stain the skin and are easily removable. 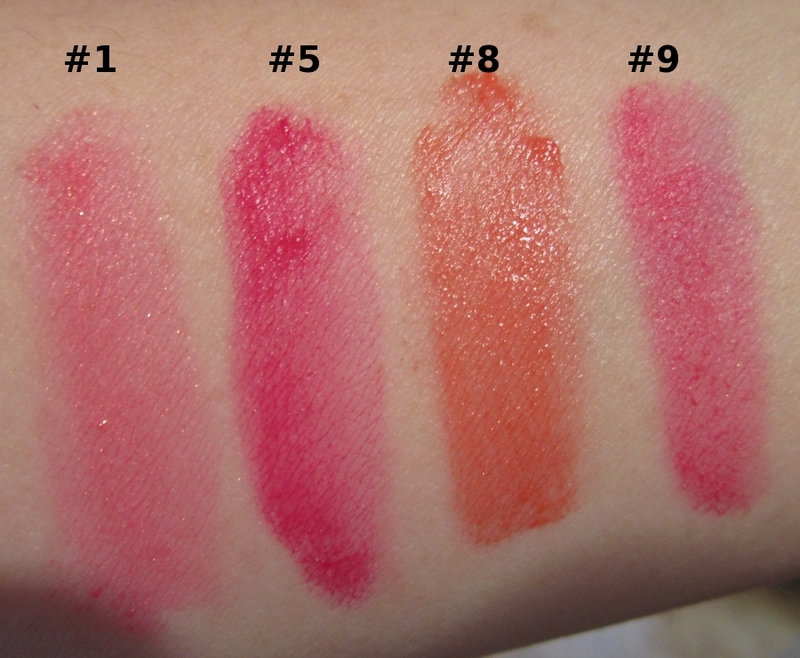 #8 HD Orange is slighty more coral compared to Becca Papaya Beach Tint, which has a stronger orange tone. The Becca Beach Tint swatches are more budge-proof than the Blushing Fabrics, which rubbed off in little flakes when I ran my finger across them after 20 minutes whereas the Beach Tints did not smudge or peel. 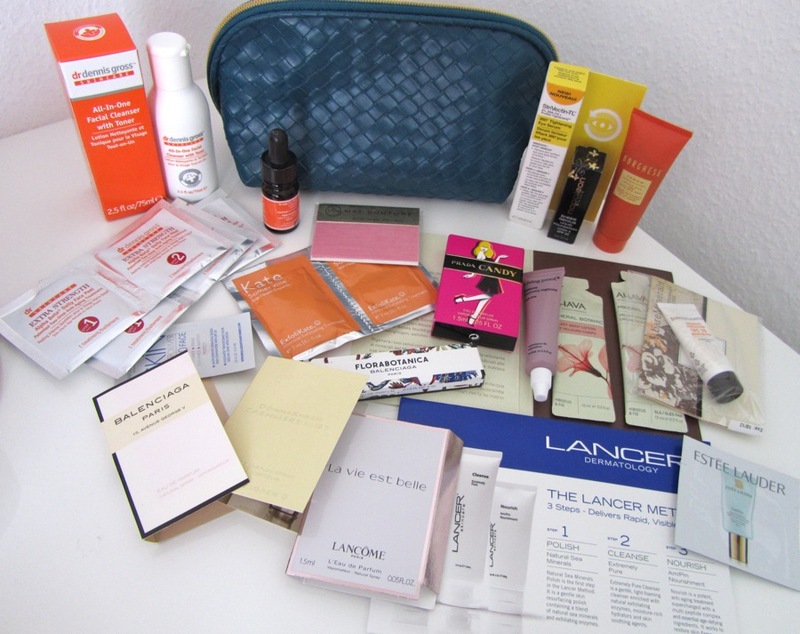 I placed my order during Nordstrom's beauty event and received this bumper crop of samples as the gift with purchase. 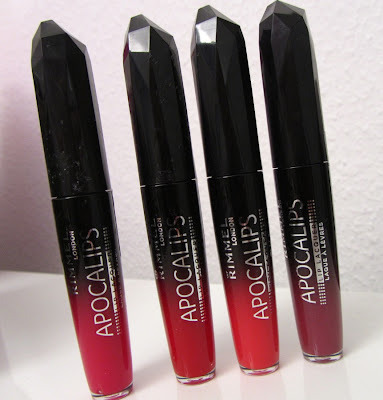 Rimmel does some of the most fabulously pigmented lipsticks on the market so it's no surprise that they are one of the first drugstore brands to attempt an intense liquid lipstick. 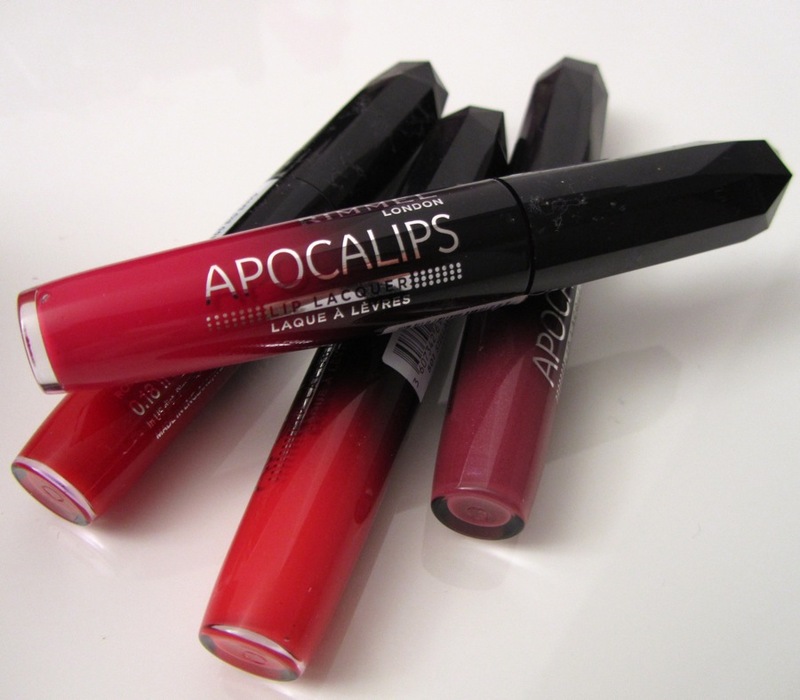 Available in eight shades, Apocalips is a intensely pigmented lacquer rouge that retails for a very affordable £6. I picked these up on my last London trip, during Boots' 3-for-2 offer. 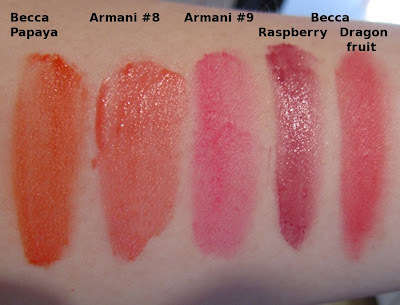 Made in England, these contain 5.5ml/0.18 fl oz., just a bit less than Shiseido Lacquer Rouge and Guerlain Rouge G L'Extrait which are 6ml/0.2 fl oz each. 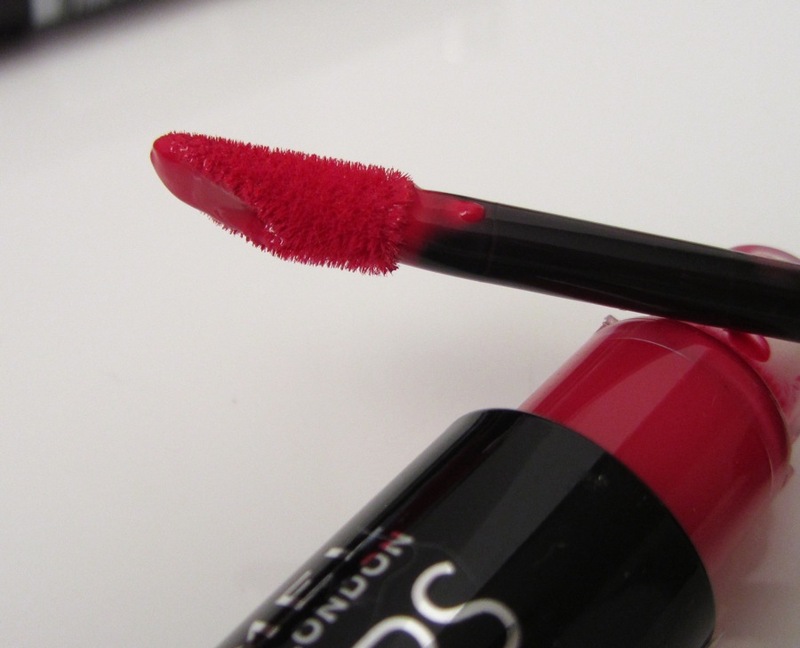 The sponge tip applicator has a concave well at the tip that holds a dab of the lipstick. 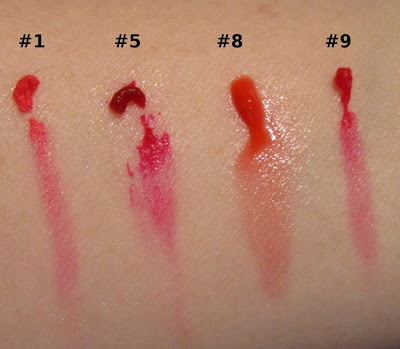 As this is so intensely pigmented, I usually apply it using the sides of the applicator, which are covered in less product, instead of the slanted tip. 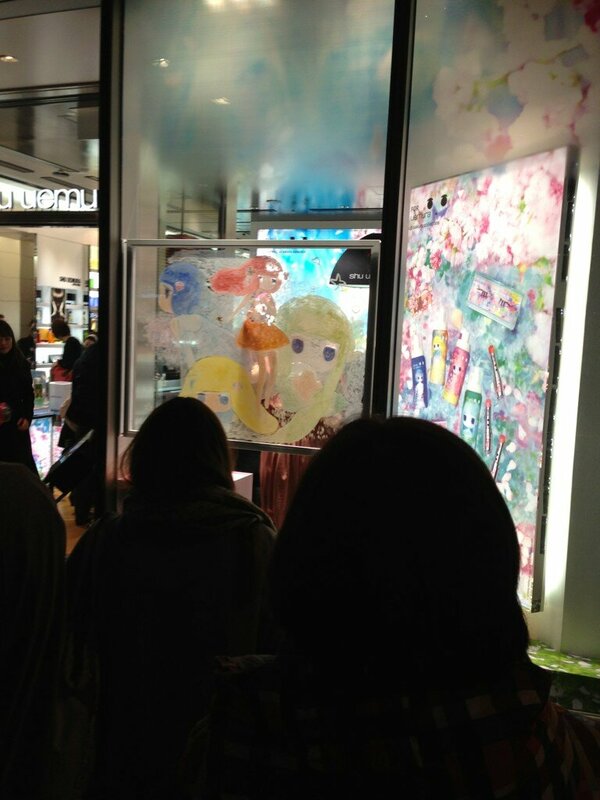 I also blot and smudge this out for a less intense effect. Apocaliptic leaves the lips slightly stained pink. 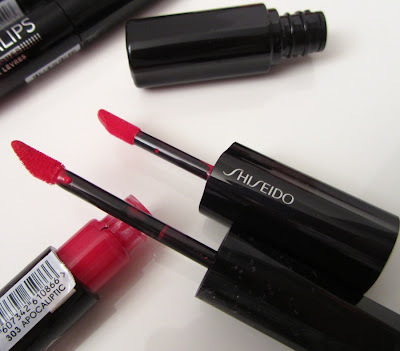 Compared to Shiseido Lacquer Rouge, the texture is very similar, dense but with enough slip to make it easy to apply. 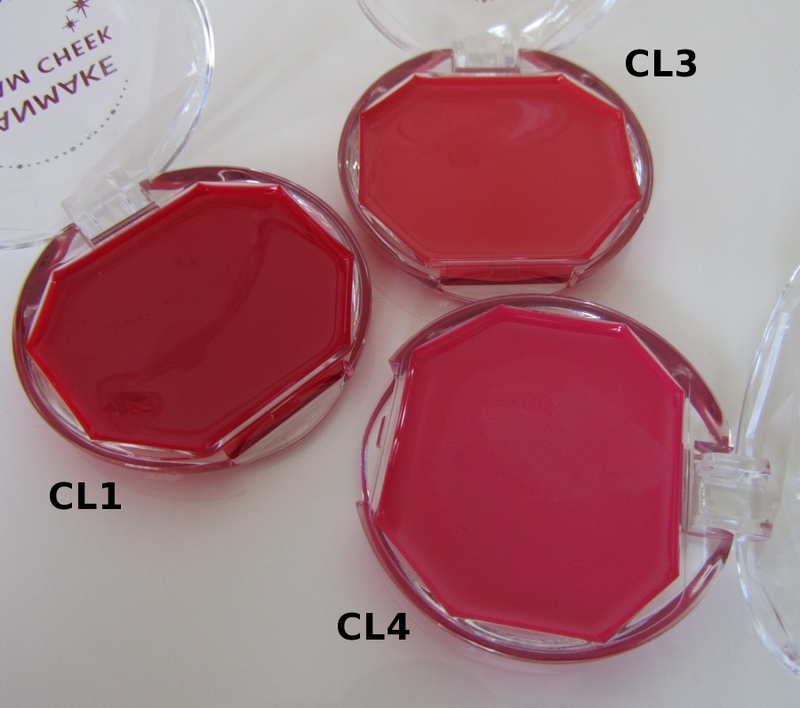 There is no shimmer or glitter, just full on color with a bit of shine. Lacquer Rouge has no discernible scent to me whereas Apocalips has a plasticky scent. I like the packaging of Apocalips except for the fact that the shade name is not printed on the tube. Instead, it's only on the white sticker, which could come off easily. 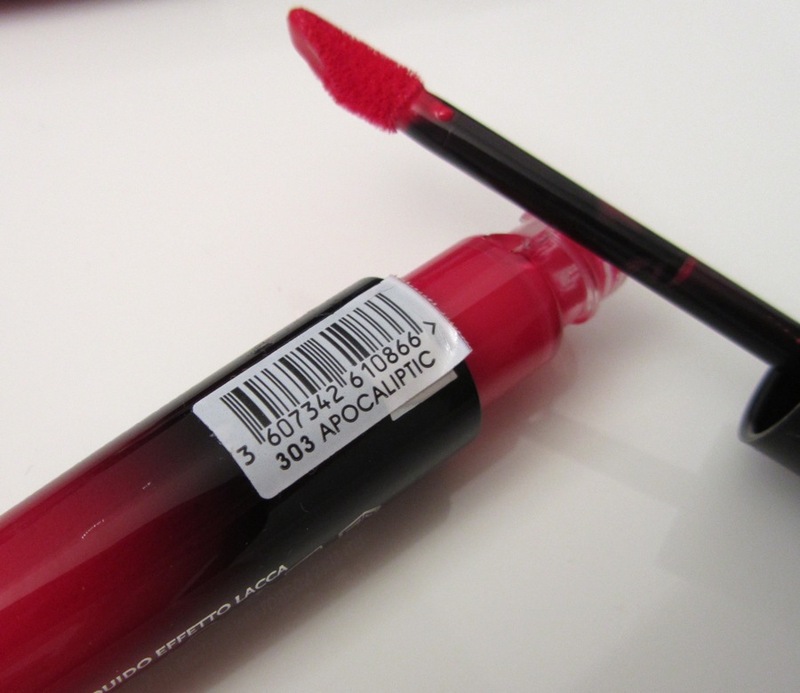 In the pic below, you can see the concave well on the slanted tip surface of the Apocalips applicator, which is slightly longer than the slanted tip surface of the Lacquer Rouge applicator. 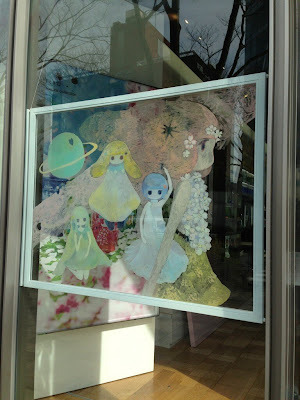 Both are adept at providing a precise application. 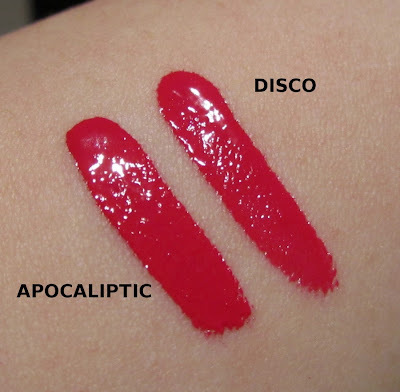 Apocalips 303 Apocaliptic, a vibrant pink is a virtual dupe of Lacquer Rouge RS404 Disco. 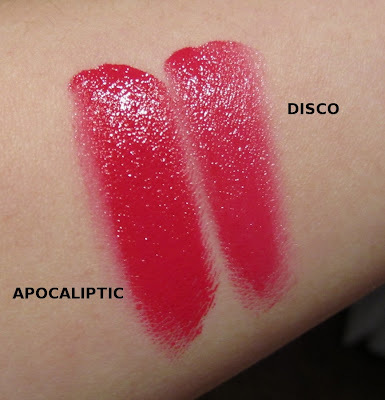 Disco leans more hot pink, whereas Apocaliptic has a touch more red. On the lips, Apocalips felt quite comfortable but it does transfer easily at the slightest touch. 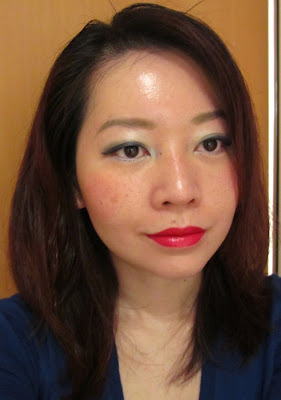 I also noticed some minor bleeding at the edges after a couple of hours. 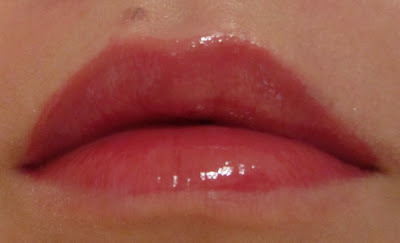 It lasted well over four hours on my lips but it did leave my lips feeling dry. 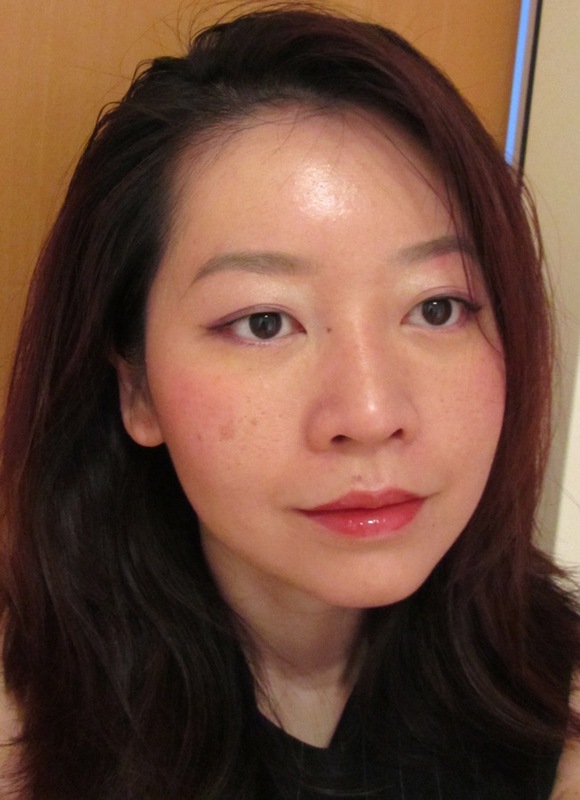 For a more hydrating version with less intense colors, I would recommend Maquillage Essence Glamorous Rouge which comes in 10 easy-to-wear shades. 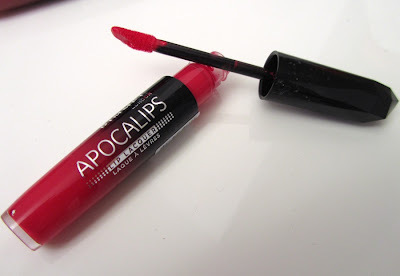 I wouldn't say that Apocalips is my favourite as I prefer more moisturising formulas but I do appreciate the intense color which comes at a fraction of the price of Guerlain Rouge G L'Extrait and Shiseido Lacquer Rouge. 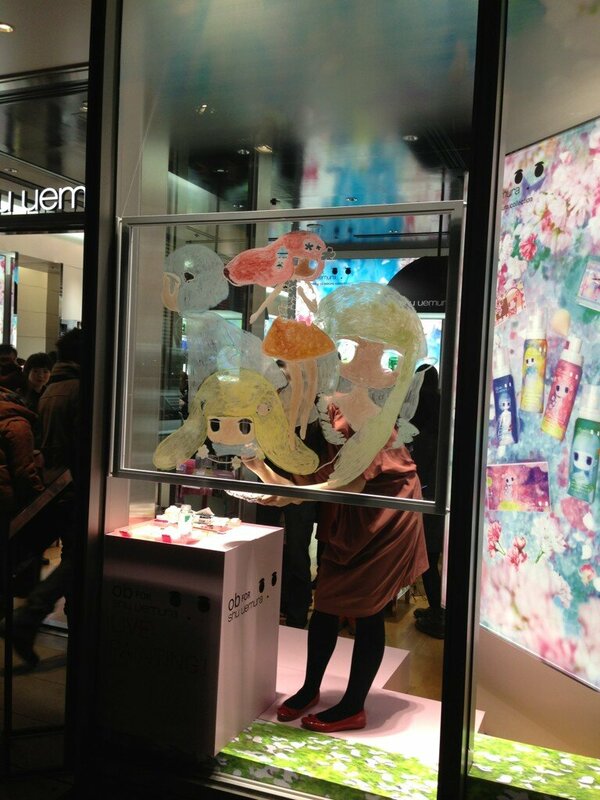 Here are pics tweeted by Shu Uemura of the live painting event by Ob-san at the Omotesando Hills flagship store earlier this week. These signed postcards were a special gift for the first 50 customers. 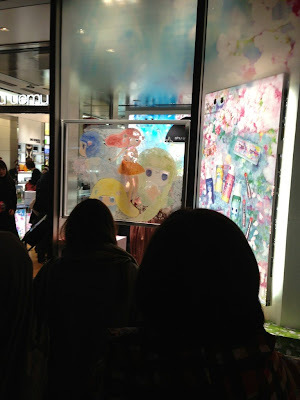 See more pics on Ob-san's blog on Vogue Japan. Jill Stuart will launch a new Angel line of skincare on 5 April in Japan. 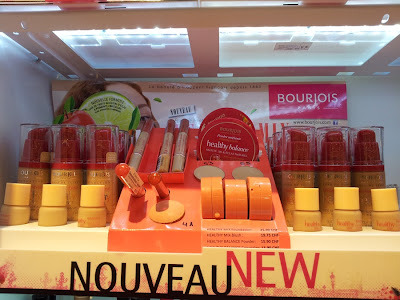 Designed to be gentle on sensitive skin types, it consists of seven products retailing between 1050yen to 2625yen. 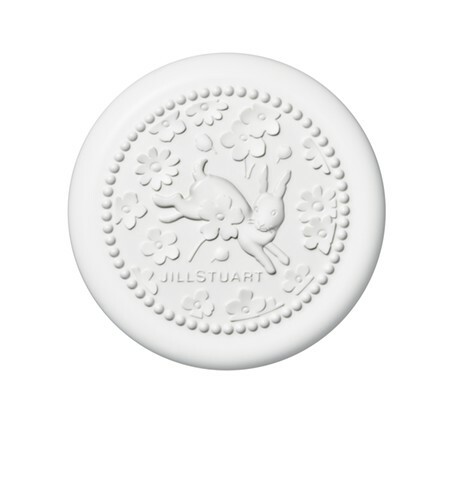 The brand has ditched its usual princessy pink jewel-themed packaging in favour of a design that is more typical of Fancl. 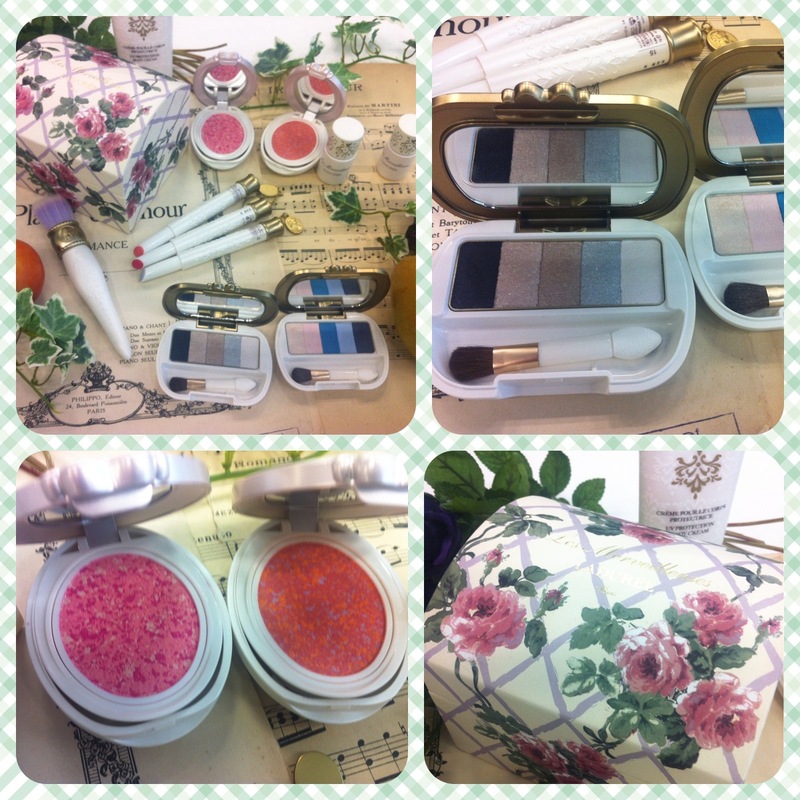 A friend in Tokyo very kindly helped me purchase these new spring releases from Canmake, Majolica Majorca, Lavshuca and Visee. 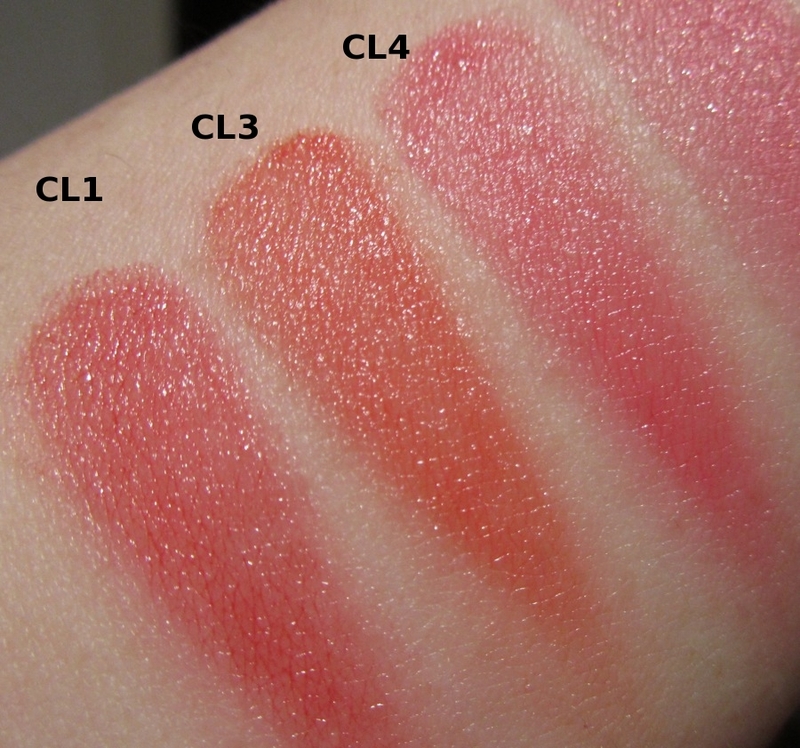 I was delighted to finally be able to try Canmake Cream Cheek CL01 Clear Red Heart, CL03 Clear Sunset and CL04 Clear Pink Joy. CL04 was released in January this year and it is limited edition. 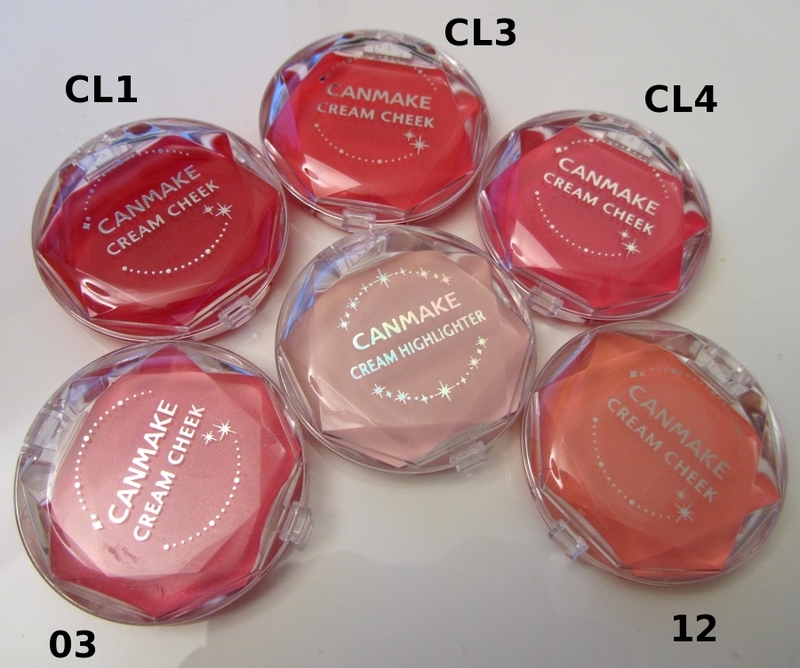 The CL shades are translucent gel creams that do not contain any shimmer, unlike the earlier Cream Cheek shades. These nifty little pots boast surprisingly good color payoff and they are super affordable at just 609yen each. Aside from these, I also own #03, #12 Marshmallow Orange and the Cream Highlighter. The swatches of the CL shades were two light layers each. 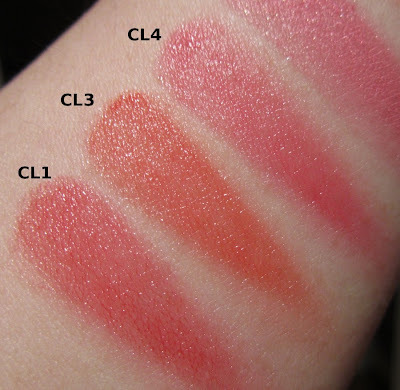 I've only tried CL04 so far and it was instant love. 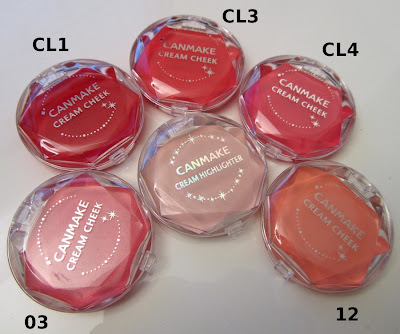 The gel cream melds effortlessly into the skin for a natural tint of color without pooling in the pores or any patchiness. There is also no stickiness at all. CL04 didn't last the whole day on me though, I would say about 4-5 hours max. 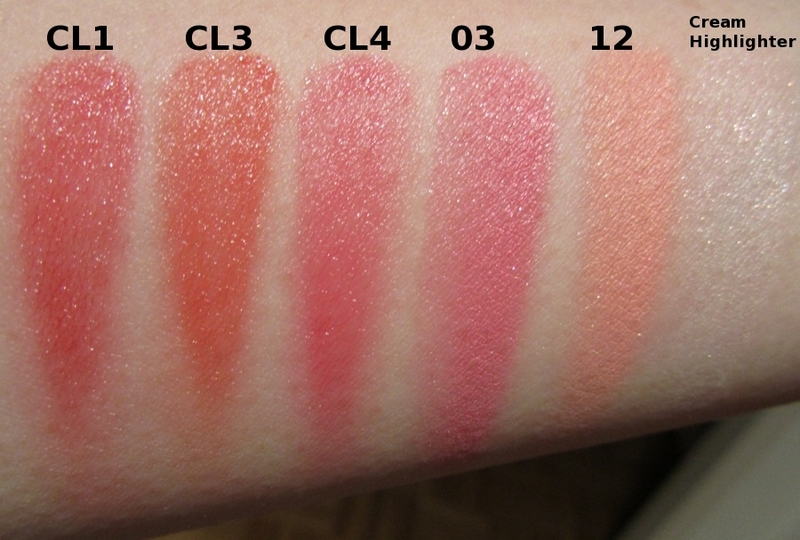 The swatches are more intense than how I would apply them on my cheeks. 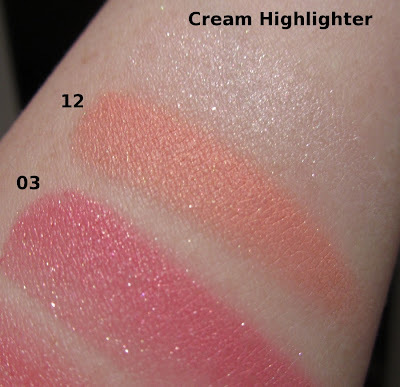 These have a more lightweight texture than the normal Cream Cheeks which are denser and creamier. I think these are a great drugstore alternative to Becca Beach Tints which cost almost three times as much. 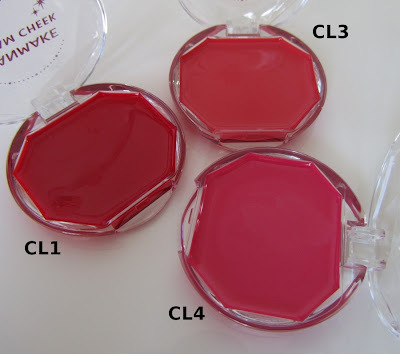 CL01 is the vibrant cherry red, CL03 is more coral and CL04 is a sweet rosy pink. In the swatches of 03 and 12, the micro flecks of shimmer are visible. 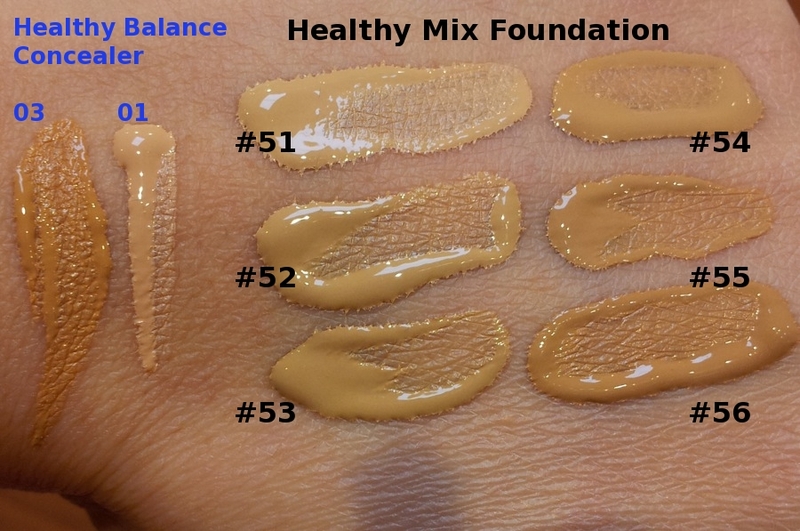 These are just one layer each. In the pic below, I'm wearing CL04 and on the lips is Candy Wrap Lip 09 Dark Night Plum.